Clydebank sit atop of the Premiership tonight after edging out Kirkintilloch Rob Roy by the odd goal in three with Nicky Little bagging both the Bankies goals. The Bankies were utterly dominant in the first half, but only had the one goal to show for their efforts. 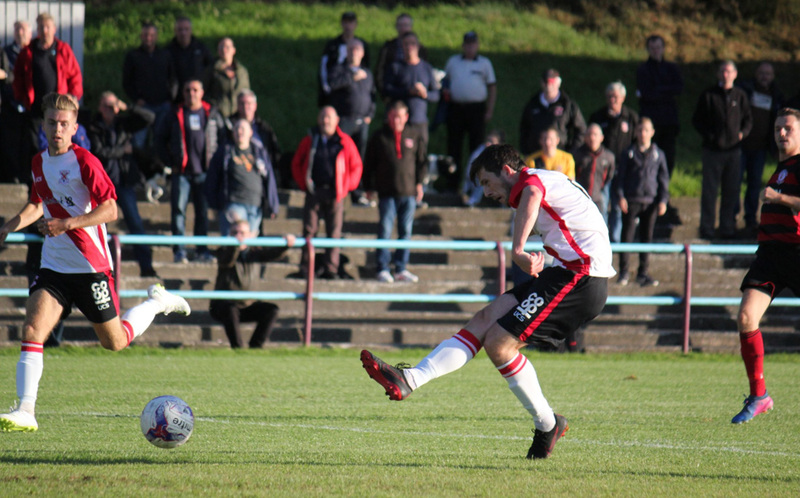 An entirely un-necessary tactical switch at half time caused the team to lose their way and gave Roy Roy a foothold in the match, and although the Bankies got their noses back in front the three points never really felt safe in the second period. With Kieran McAnespie back from his holiday a number of changes were made to the side that cruised past Irvine Meadow on Saturday. In Came Chris Dooley, Jack McClair, and Michael McIndoe into the starting line up. The formation looked to be a little bit more cautious with Nicky Little in a slightly more withdrawn forward role, and it seemed to work a treat in the first half, as the Bankies carved out numerous goalscoring opportunities. It only took two minutes for the Bankies to get behind the Rob Roy defence. Cammy McClair's devastating pace took him past Water as if he wasn't there. The winger bore down on Hutchison but only succeeded in rattling his shot off the keepers legs. Hepburn should have stuck the rebound away but fired over the bar. McIndoe hit a free kick that Hutchison had to clutch under his crossbar before Hepburn had another great chance to score when he scrapped to win the ball on the left hand side.He closed in on the Rob Roy goal but like McClair before him, he slammed his shot off the keeper legs.. Rob Roy had not been in the game at all, but out of nothing had the ball in the net after 17 minutes, A cross from the left was completely mis-kicked by Connor Hughes. It looked liked it was a fresh air swipe that cannoned off his standing leg completely outfoxing Marc Waters. Luckily for the Bankies the Assistant Referee had his flag raised for offside as the ball entered the net. Hepburn had another chance after 33 minutes when he met a Dooley cross from the right, but his first time effort was mis-timed and his shot scooped into the air and floated past the post. A minute later however, Bankies took the lead through Nicky Little. Sean Higgins did well to prod the ball beyond the home defence. Little raced toward goal for the third one on one with the goalkeeper. This time no mistake was made as he side footed the ball low into the keepers right hand corner. Clydebank kept the tempo up right until the interval but were unable to add to their lead. Then it all seemed to go a bit awry in the second half. It didn't help that Sean Higgins limped off the field early on, but the personnel were shifted about. McIndoe moved out left, Nicky Little dropped back, and Hepburn went through the middle with Substitute Stevie Higgins. This more traditional 4-4-2 set up seemed to knock the players out of their stride, and Rob Roy got on the front foot. Clydebank were suddenly making too many slack passes and the home side could sense they were back in the game. 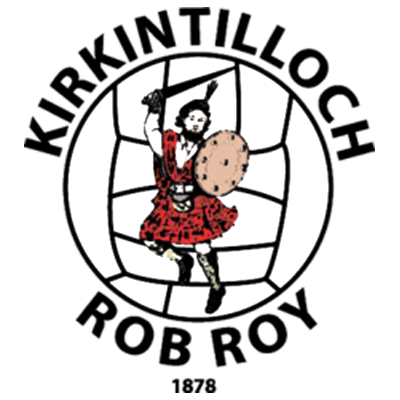 In fairness, although Rob Roy were more forward thinking they did not look like unlocking the Bankies defence. Long throws and punts into the box looking for a favourable second ball were the order of the day. It was from one of these balls into the box that the home side got the break they were looking for. It was difficult to see exactly what happened but it looked like Alan Vezza was adjudged to have held back a Rob Roy attacker in the box. The ref immediately pointed to the spot and booked the Bankies defender. Lee Gallacher took the spot kick and sent the ball beyond Marc Waters to make the scores level. The Bankies seemed to revert back to their original formation with Hepburn returning to the wing, and it wasn't long until Clydebank were back in front. Nicky Little was played in to the box on the left hand side by McIndoe. It looked like he may have taken too long when a defender closed him down, but he calmly turned inside before slamming the ball low into the net. Clydebank have great options on the bench and soon introduced Shelvey and Black for Little and Hepburn. 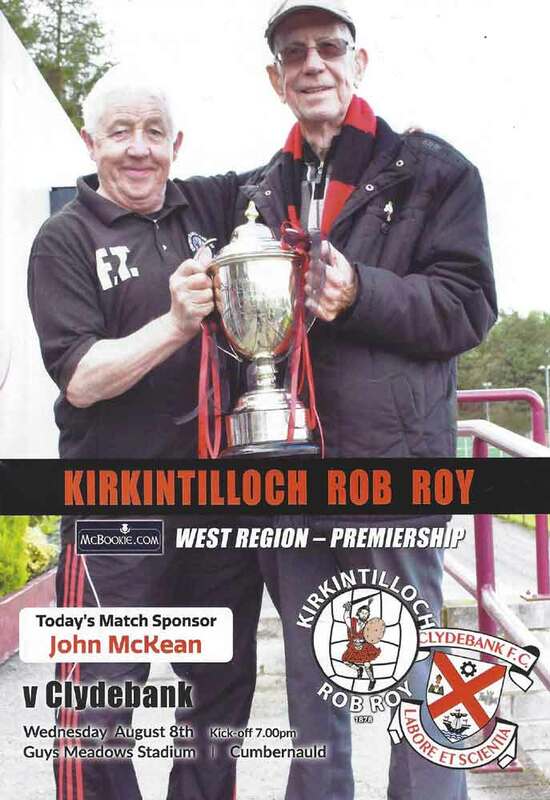 The Bankies were playing much better now, but Rob Roy were never out of it. The set piece threat was always there but their best effort came from a low drive by Gallacher that went through a ruck of players legs. Waters dived to his right to make an important save. The Bankies could have wrapped up the points with two great chances. Firstly, Stevie Higgins won the ball on the edge of the box. He drove towards the goal, but his stabbed effort hit the side netting. Then, McIndoe leapt like a Salmon to head the ball into the path of Shelvey. The Bankies forward attempted a neat, dinked lob that was superbly swatted away by Hutchison. The Bankies had a few nervy moment in injury time, but saw out the time to take the three points. This has been a great start to the season for the Bankies. Five straight wins, only one goal conceded (a penalty) and two away league victories. The Bankies only won once on their travels in the league in the whole of last season. The second half of this match was the first real test the players have faced, and despite a bit of a wobble they came through with the win, and that is the most important thing. 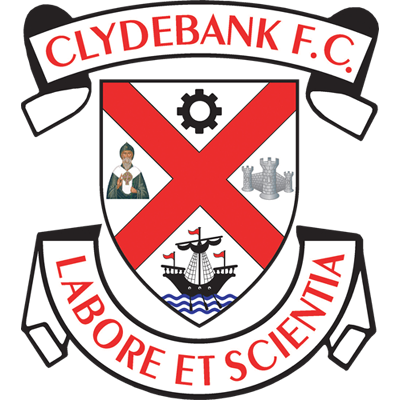 On-form Cambuslang visit Lochburn Park next, and if the Bankies want to remain at the top of the table then another big performance will be required.